A castle with turrets on a hill overlooking a mighty river and a quaint old town: it does strike a pose. Little wonder, then, that the Fairmont Le Château Frontenac in Quebec City claims to be the most photographed hotel in the world. In this time of ubiquitous smartphone cameras and social media posts, that’s a difficult claim to quantify. 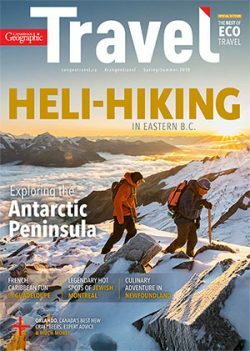 What isn’t in doubt, though, is the hotel’s place in the Canadian passport (check page 24) and in the pages of history. The grand railway hotel, which this year celebrates its 125th anniversary, has borne witness to some notable moments in Canadian politics and pop culture. Even its location is significant: it was built on the site of the 1864 Quebec Conference, where the fathers of Confederation met to continue hammering out the British North America Act. 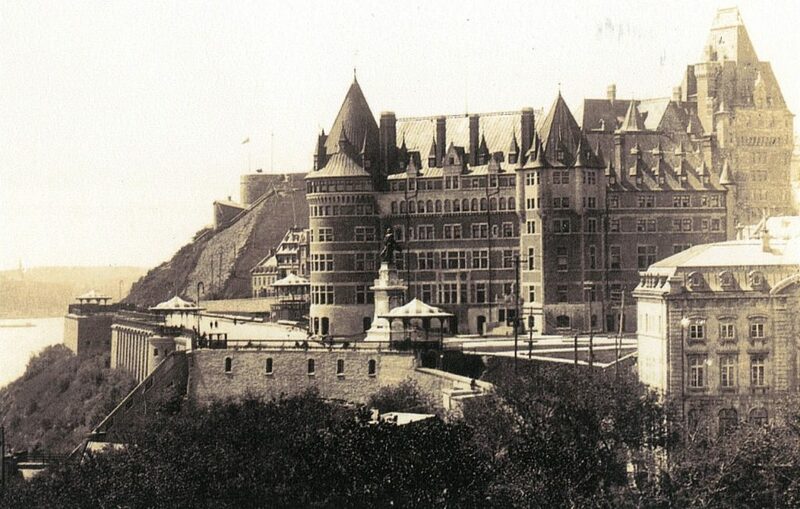 Here’s a look back at some other historic happenings in the life of the Château Frontenac. The Château Frontenac was named for the colourful, flamboyant, luxury-loving Louis de Buade, Count of Frontenac, who governed the colony of New France off and on from 1672 to 1698. (Today the hotel contains a display of 17th and 18th century wine bottles unearthed during archeological digs in the city, a wry homage to the bon vivant French governors). The hotel was designed by architect Bruce Price, and like many of the grand railway hotels built by William Van Horne, general manager of the Canadian Pacific Railway, to encourage tourism by rail, it was inspired by the Renaissance-era châteaux of France’s Loire Valley. During World War II, the Château Frontenac was the site of two important conferences on military strategy. 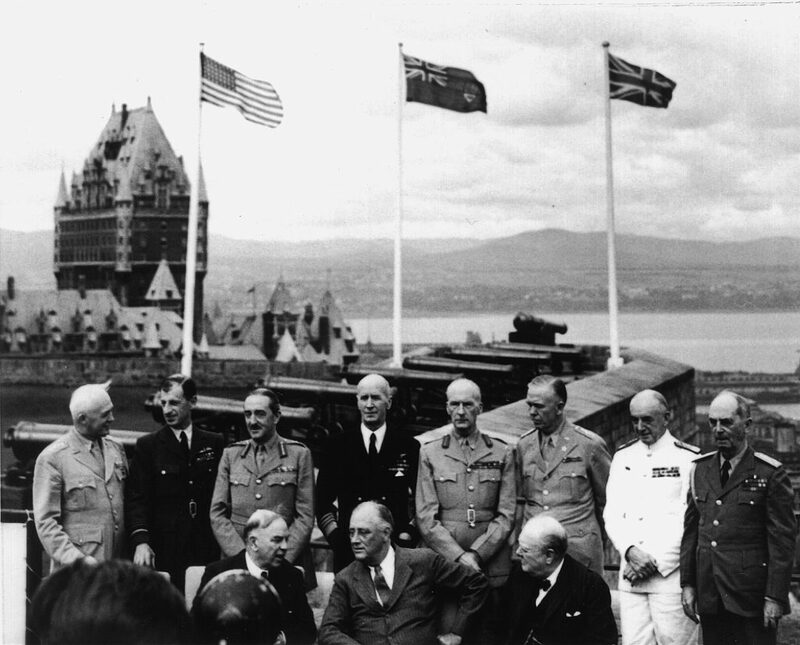 The first Quebec Conference, in August 1943, was attended by the leaders of the Allied powers, U.S. President Franklin D. Roosevelt and U.K. Prime Minister Winston Churchill, and hosted by Canadian Prime Minister Mackenzie King. (Stalin was invited but did not attend). “There was major security, on the river, at the Citadelle, and with us. They literally closed … and took over the entire hotel,” says Robert Mercure, current general manager of the Château Frontenac. The main purpose of the conference was to plan the invasion of Normandy. But although this major secret strategy session was held in Quebec, King’s role was mostly ceremonial: Roosevelt and Churchill signed the Quebec Agreement, outlining the terms for the coordinated development of nuclear weapons, without Canada’s input. In September 1944, after the success of D-Day, the leaders met again at the Château and reached agreements on several issues, including a plan to demilitarize Germany. Once again, King was not invited to the key meetings. The divisive Duplessis, who served as Premier of Quebec from 1936 to 1939 and again from 1944 to 1959, took over a grand room adjacent to the hotel’s restaurant, Le Champlain, and made it his office in the 1950s. 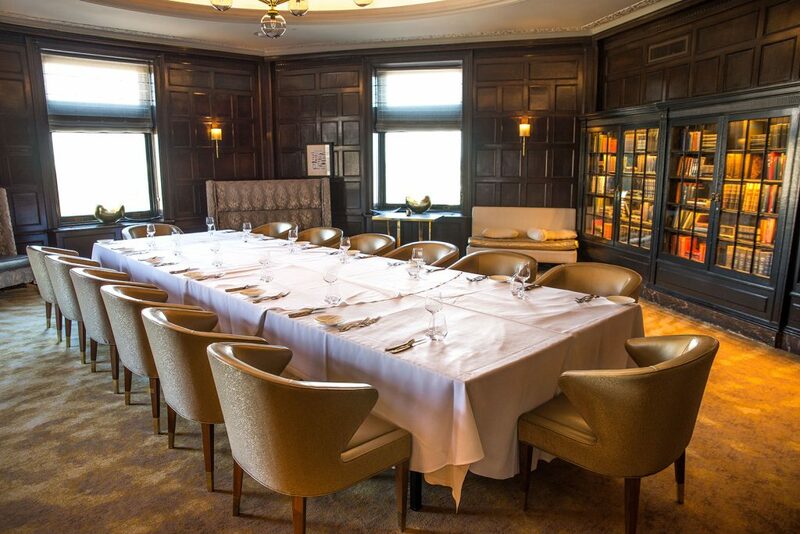 The elegant, wood-panelled room is now used as the hotel’s library. Duplessis also took up residence in suite 1107 of the Château (where, according to his biographer Conrad Black, he listened nightly to opera and classical music and left newspapers scattered about), and was a regular at the hotel’s barbershop. Director Alfred Hitchcock arrives at Quebec's Capitol Theatre for the premiere of his film I Confess, which was filmed on location in the city. Also pictured, left to right, are Roger Dann, Renée Hudon, Anne Baxter, and Carmen Gingras. The Château makes a star turn in the 1953 Alfred Hitchcock film, I Confess, which stars Montgomery Clift as a devout priest framed for murder. Filmed on location in Quebec in 1952, many of the city’s landmarks appear in I Confess, making perfect — and, in the case of the escalier casse-cou (“breakneck steps”), perfectly-named — backdrops for the moody film noir. 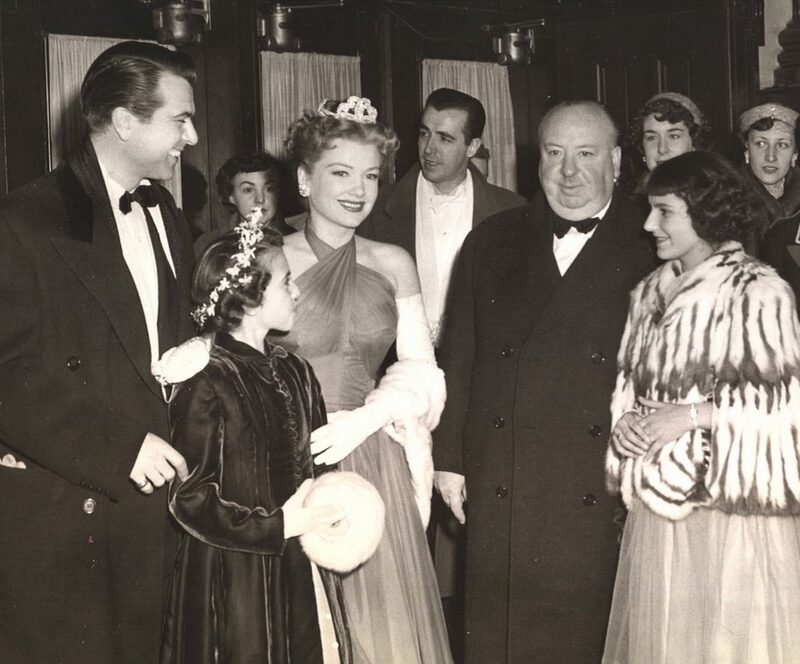 Anne Baxter, who co-starred in the film, impressed the Château’s staff with the fat cigars she smoked off set. The hotel’s manager at the time, George Jessop, played himself in the film. The Château recently opened, as part of its new celebrity guest suites, a suitably atmospheric suite in one of its turrets dedicated to Hitchcock. By 1990, 22-year-old Céline Dion had already released several French-language albums to acclaim in Europe and her native Quebec, but she was still far from being a pop superstar like her idol, Michael Jackson. So, in July 1990, René Angelil, Dion’s manager and future husband, arranged for the chanteuse to perform in the ballroom at the Château Frontenac during a conference for record label executives at the hotel. She had only to belt out one or two songs in her powerful, emotive voice before CBS Records was persuaded to back her crossover into the English market. Within a year, “Where Does My Heart Beat Now?”, the first single from her debut English-language album Unison, would reach number four on the Billboard Hot 100 chart. 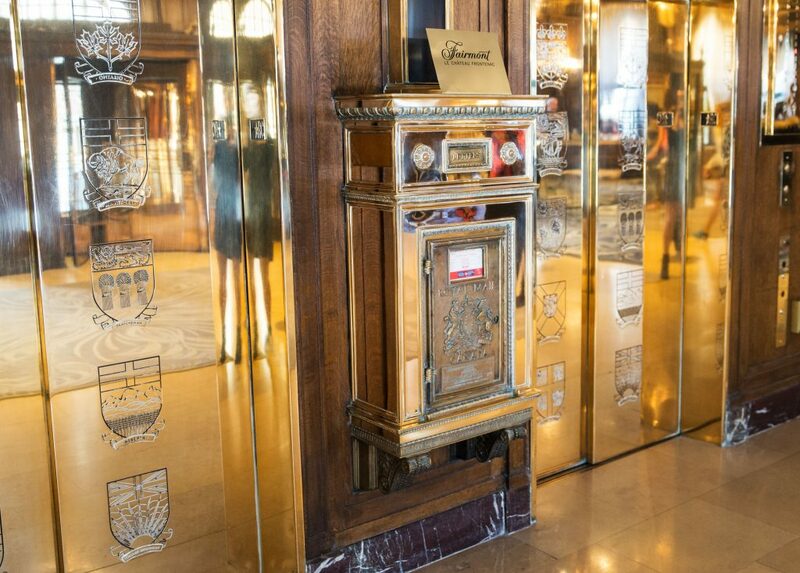 In recent years, the beautiful old brass chute mailbox in the lobby of the Château has become a popular selfie spot for visitors from Korea. Why? Several years ago during maintenance work, hotel staff found a postcard that had been stuck between two floors since World War II. The postcard was written by a soldier who was off to war and asked his sweetheart to wait for him. We don’t know what became of the lovers; staff say they tried diligently to find the intended recipient and the family of the sender, but with little more than first names to go on, they didn’t have any luck. Still, the story inspired the producers of the mega-popular Korean supernatural soap opera Goblin: The Lonely and Great God to shoot an episode in Quebec and at the hotel. The Château has seen a fivefold increase in Korean visitors since the series aired.